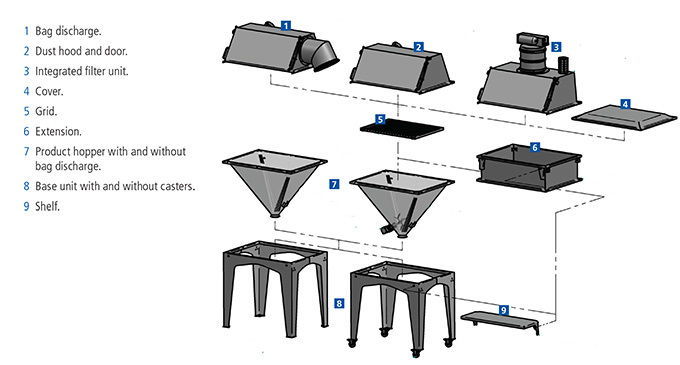 With Volkmann Bag Dump Stations, products such as powder, dust and granulated material can be discharged directly from barrels, drums, bags, special bins and containers, even with plastic liners. 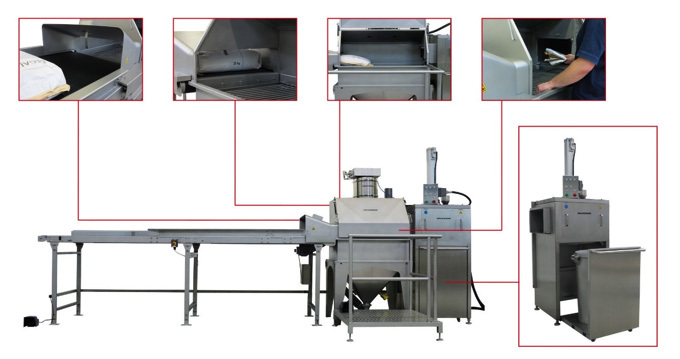 Volkmann stations include practical solutions used in simple “minors addition” or the regular opening and transfer of production batches of product, from 25 or 50 lb. bags, with or without containment. There is a solution for just about every situation that is likely to be encountered in the product environment, from simple to complex to highly contained and custom designed. From fume silica to tungsten metal powder our extensive experience over 40 years of manufacturing provides the right solution for your application. Combine these units with process control systems and integrate remote controls or monitoring systems. All levels, alarms and error messages as well as other required information, can be transmitted by an interface for evaluation and monitoring. 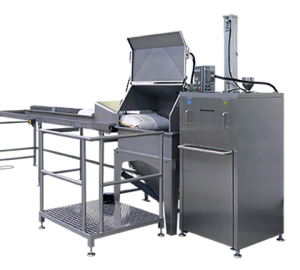 Volkmann offers an extensive range of product loading stations and bag dump stations for bagged materials. 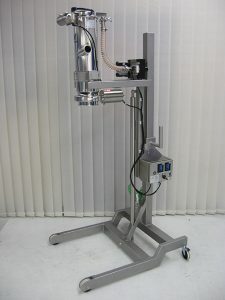 Systems with a variety of filling volumes available, from mini (1 ft3) to maxi (> 15 ft3). All stations are designed and manufactured by Volkmann in Germany. All parts with product contact are made of stainless steel 316L (1.4404). Systems can run under inert gas if required for quality or safety reasons upon request. High quality, high potency powders and fines require dust-free material handling. Volkmann’s contained Rip-and-Tip dump station allows the opening and discharging of materials from bags, boxes and small containers completely free of dust and contamination. With the RNT-CON, critical powder handling processes are made safe in the ever more demanding processing environment. The RNT-CON’s modular design of its product feeding station, enables a flexible design with various functional units and options. Bags or containers are fed semi-automatically into the isolator via a roller conveyor (loading through containment gate optional). They enter a dust lock section and subsequent negative pressure unloading chamber. Inside the glove box isolator, they are opened manually and discharged into the feeding hopper for transfer by the vacuum conveyor. 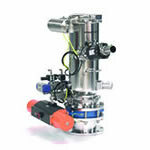 Optional Hepa filters, Lump breakers/crushers and material agitators are available. If required, the closed station can be flushed from within using a hand washing gun or WIP/CIP. 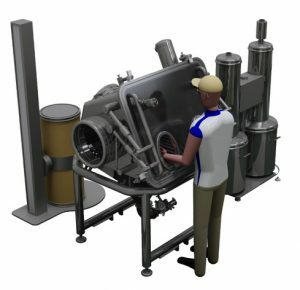 The illustration at left shows a high containment station with a no-tip unloader as well as push-push Hepa filtration and WIP/CIP. Modular connection to bring out the emptied bags, either with bag compactor, endless liner etc. 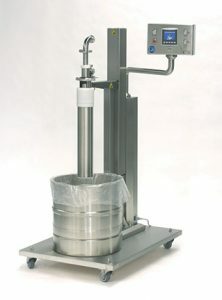 Volkmann systems for discharging bulk material from drums either work by tilting and emptying the barrels into a material sending station or by an automatic guided suction lance, aptly named the “No-Tip Unloader”. Feeding the lance may also be performed manually. Special secondary/feeding air systems take material from barrels with liners or directly from sacks. These systems provide an extremely gentle material transport from the barrel and work successfully with sensitive and easy to damage tablets. They do so by monitoring and regulating the suction air flow to avoid greater pressure on sensitive bulk goods, which can occur with tilting systems. The system also allows the discharge of material from drums with liners under full containment to work in a closed system under controlled environmental conditions. 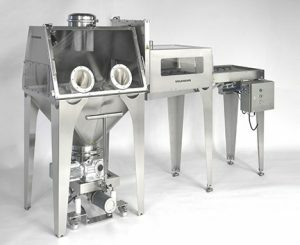 Docking of Vacuum Conveyors safely and dust-free with mobile hoists directly on top of filling machines, tablet presses etc. Put Volkmann’s experience in powder handling to work for you. Ask us about possible solutions and ideas for your material transfer application.